◉ Easily generates self- executable setup files. ◉ Takes less memory space. ◉ Ability of generating the uninstall setup. 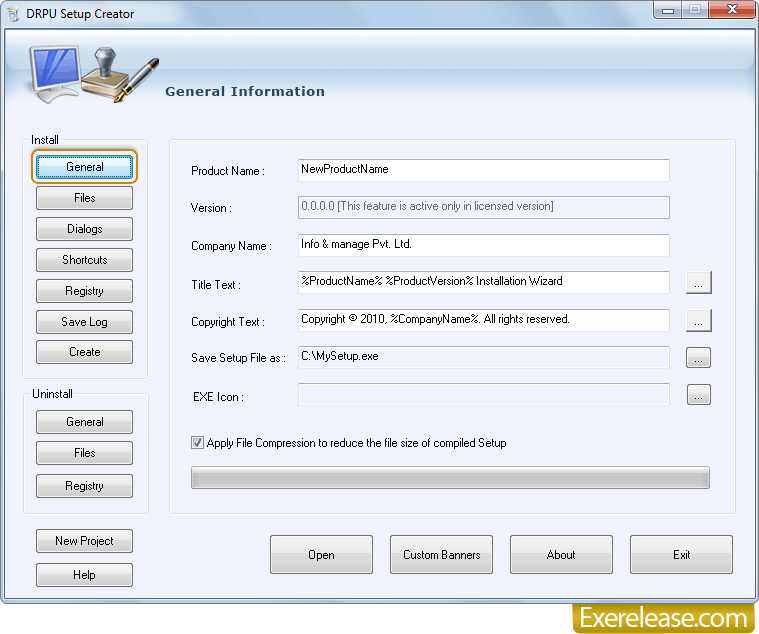 ◉ Creates EXE file with full accuracy. ◉ Maintain the software originality. Facing with software installation problem? Don’t panic!! Now start saving your time with our Setup Creator Program. Software installation package will easily install setup files and programs on the end user’s machine. Setup creator tool quickly generates any software program setup. Professional installation utility has easy and effective solution to create the setup of any computer program developed in any language. Customized setup has reasonable price and alternative solution as compare to complex and expensive setup creator tool. Setup maker has simple functionality and no change in the originality of the application program. Setup generator has an attractive user interface and affordable. Created setup file smoothly runs and install on all windows platform. Setup builder supports all application program developed in any language. Compact installation utility has an attractive graphical user interface and you need not require any programming or technical skills to operate on it. Setup builder application is quite handy, easy and has simple functioning. Thus we provide you a cost-effective setup creator tool that quickly generates the executable files of your computer programs. Moreover Setup creator tool has even got the ability of generating the uninstall setup and customized dialog box.